A unique gift for dog lovers and pilots! 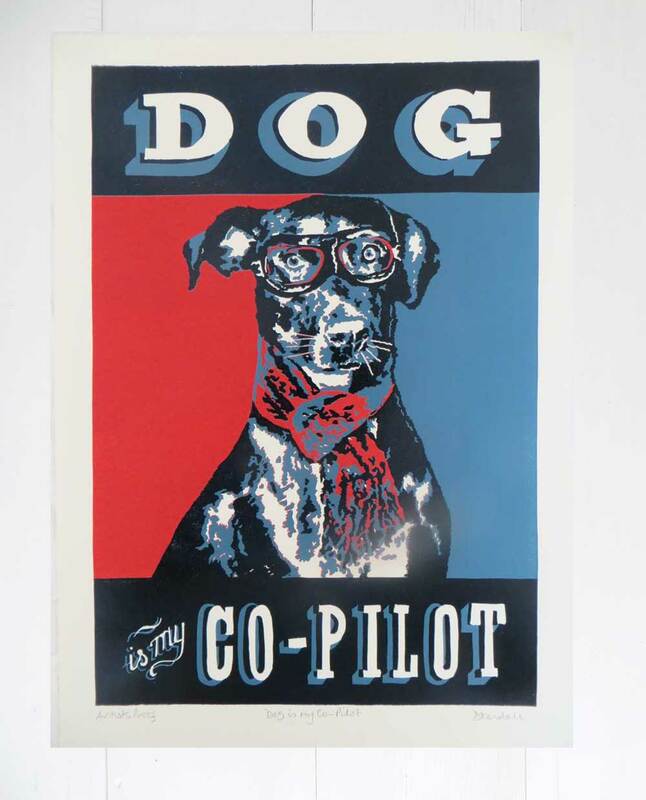 I created an exclusive print under the title “Dog is my Co-Pilot” for Pedlars, a UK company that sells quirky and original home-wares & gifts, both vintage and new. A love of dogs has always been a central theme of the company. Inspired by pop art propaganda posters with their simple graphics and strong colours, this print is a 3 colour reduction linoprint, produced in a limited edition of 50. Once these are sold there will never be any more printed because the process of making a reduction linoprint destroys the very printing plate that is used to create the prints – this is why it is sometimes called a suicide print! Find out more about how this print was produced on my blog, The Inky Dog Press.